Making homemade salad dressing lets you skip the scary ingredients so your salad stays healthy. I started making salad dressing from scratch when we decided to cut high-fructose corn syrup and most preservatives from our diet. At first, I stuck with a basic vinaigrette, but over time I found a few recipes and tinkered with them until everyone in my family was pleased. 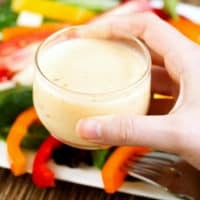 Turns out, homemade salad dressing is an easy thing to whip up while waiting for dinner to cook, and it tastes a lot better, too! 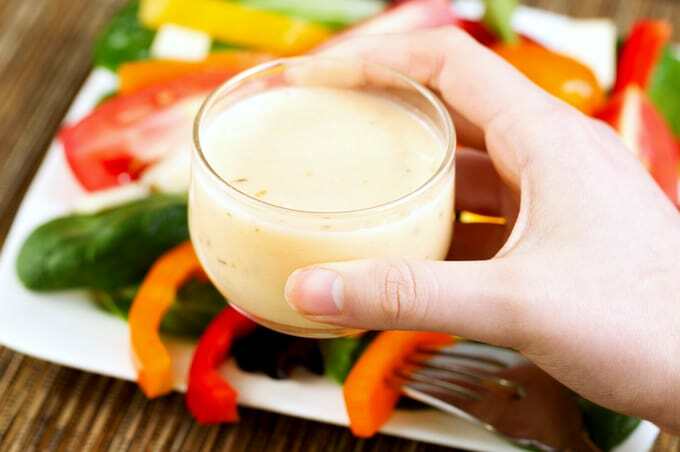 So here is how to make homemade Ranch, Thousand Island, Italian and French dressings. Enjoy! This Ranch dressing is wonderful on top of salads and also as a dip. Want to avoid double-dipping? Put a generous dollop in the bottom of wine glasses or small Mason jars then insert celery and carrot sticks. It’s cute, and it allows everyone to double-dip to their hearts’ content. Drizzled over a salad or served as a dip, this tastes just like the real thing! Combine all ingredients in an air-tight container. Combine 1 tablespoon of mix with 1 cup mayonnaise and 1/2 cup buttermilk in a Mason jar. Shake well. Let chill 1 hour before use. Combine 2 tablespoons of mix with 8 oz. sour cream. Stir well. Chill 1 hour before use. My recipe for Thousand Island dressing has a bit more zing than the commercial stuff. If you’d like to tone yours down, omit the dry mustard powder. Want more kick? Add a splash of hot sauce. And consider using my chili sauce recipe instead of the bottled stuff! A zippy, creamy dressing to give your salad some kick! Combine all ingredients in a bowl. Mix well. Season to taste with salt and pepper. Chill one hour before use. I love to keep Italian dressing in the fridge for use on salads or to marinate chicken. Just pour it over boneless, skinless chicken breasts before baking, or shake chicken kebab fixings in it an hour or so before grilling. Yum! All the robust flavor of your favorite Italian restaurant's salad dressing, made fresh at home. Combine all ingredients in a jar with a tight-fitting lid. Shake madly. Let chill 1 hour before use. This recipe is nothing like the standard salad dressing served throughout France. Most salads there are dressed with a vinaigrette made from good quality vinegar, some oil, crushed garlic, a bit of Dijon mustard and a sprinkle of tarragon. I’m really not sure why we call this French dressing inthe States, but this very much like the stuff you’d buy in the store… only better! A homemade version of the bottled French dressing you'd buy at the store...but better! See, homemade salad dressing isn’t just simple, it can save you a bit of money. Plus, it’s healthier. Just remember to keep it refrigerated, mix well before each use, and toss it after one week if there’s any left. Want to remember these recipes? Pin this! Oh, I love homemade salad dressings. They always taste so much better than anything you can buy in a bottle at the store. Thanks for sharing these!